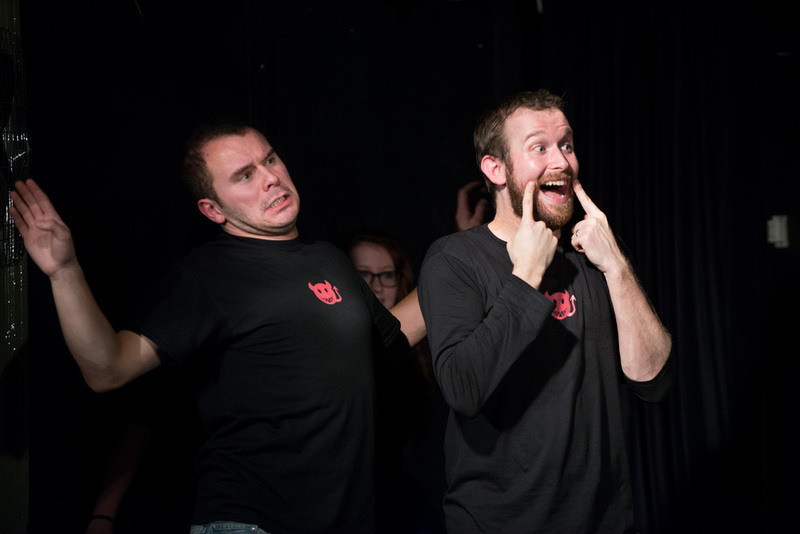 The Oxford Imps' show is their own blend of clever, light-hearted, family-friendly improvised comedy. Each show is comprised of improvised sketches, games, stories and songs, culminating in an improvised mini-play, which can vary from Shakespeare plays to Broadway-style musicals! This year featuring guest improvisers from all over the globe, to make a show that is packed full of quick wit and boundless energy, to kick-start your comedy engine! They're not all students: Auditions are open to all from town and gown, and members have included University lecturers, a dictionary writer, Jam Factory manager, film-makers, a primary school teacher, baristas, political analysts, and East Oxford slam poets. They’ve played anywhere – musical festivals, ski resorts, allotment associations, and one 80th birthday in a living room. In New York they performed at the Magnet Theatre and UCB East, and in Nashville at the Belcourt Theatre. …though now they set the questions, with former Imps now working behind the scenes at Have I Got News for You and QI. They don’t all become comedians: of the 138 people who have been Imps, alumni have become everything from novellists (Rose Heiney; Heather McCrobie), to tea party bloggers (Keli Carender, aka Liberty Belle). Current members Jim Grant and Hannah Madsen have been in the Imps since the very first show in January 2004. Current Imp Tom Skelton, who joined in November 2006 has performed 403 shows with the group. They don’t just play for laughs: having organised improv workshops for Bosnian orphans, and raised money for the homeless with their regular 12-hour improv marathon, ‘no fixed abode’. Whilst in the imps, John Gethin won Channel 4′s ‘Beauty and the Geek’ (as the geek). They really do make it up. Rachel Parris – runner-up, Funny Women Awards 2010, finalist Leicester Square New Act of the Year 2011, presenter of Throne Cast on Sky Atlantic. John Gethin – winner of the UK reality TV show Beauty and the Geek. From Alan Bennett to Josie Long; from Stewart Lee to Armando Iannucci; from the creators of QI and Blackadder, to two fifths of the members of Monty Python, the number of comics with a link to Oxford University is truly impressive; nurtured by student drama, and by the Oxford Revue (our friendly rivals) in the dark pre-improv days of the University’s history. You could even – tenuously – claim there’s a royal connection to Oxford student comedy, dating back to students entertaining Queen Elizabeth in the 16th century. But Oxford the town has played a vital role in more than a few comedy careers – for instance, Ronnie Barker grew up in Oxford and cut his comedic teeth at the Oxford Playhouse, and the pub down the road from the New Theatre, The Four Candles, is named for his most famous sketch. The Pegasus theatre in East Oxford has been a base for a huge range of experimental theatre and clowning; and today, through venues such as the Cellar and the Art Bar (the Bullingdon Arms), not to mention the Glee Club near Oxford station, and the giant New Theatre itself, most nights of the week will see Oxford audiences entertained by comedians great and small. The Oxford Imps are proud to play a small part in both town and gown traditions of comedy at Oxford. Long may they continue. For quotes or any further information about our shows or annual Edinburgh run, contact us here.